Peter Young took this photo on May 2nd 1973, a view overlooking the M4 with Brentford Nylons HQ and in the distance the Beecham Building. Peter took another photo on the same day which gives a closer view of the three tower blocks. In both photos more block fill the horizon - London. The church or chapel, centre left - possibly Park Baptist Chapel? 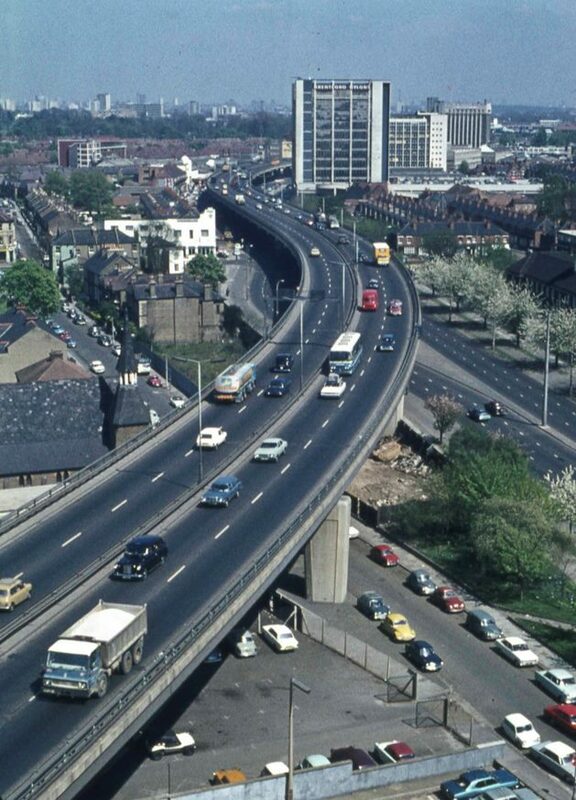 The two-mile viaduct was constructed in 1964 to link the A4 (Great West Road) to the M4 and at the time was the longest viaduct in Europe. Brentford through time by Gillian Clegg includes a photo taken during construction and a similar view from around 2011. For a wintry view of the construction of the M4 see Colin Carter's photo taken around 1964; this also shows the Beecham building with its Lucozade sign.